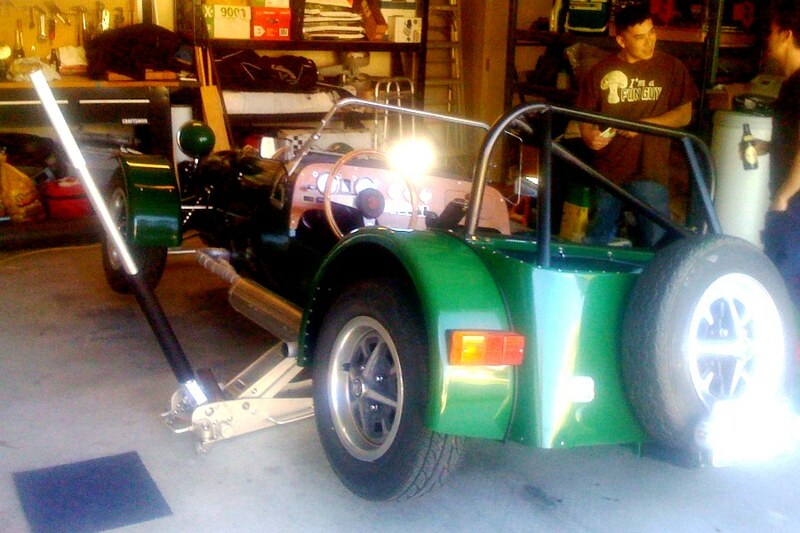 We drove the Locost over to a friend's house last week to get the car corner-weighted. The main purpose of corner-weighting is to insure that each of the four tires is doing its share of the load in holding up the car, and also in keeping the car from skidding off the road in turns. We like that idea, but we were actually more interested in finding out what the car weighs. Not that we could do anything about it at this point, but we were curious. As it turned out, we might've preferred not to know. We thought we balanced the load on all the tires pretty well when we installed our new GAZ shocks. We adjusted the front spring perches so the lower A-arms were parallel to the ground, and the back perches so the trailing links were parallel to the ground. We also made sure to set the perches at the same height side-to-side. 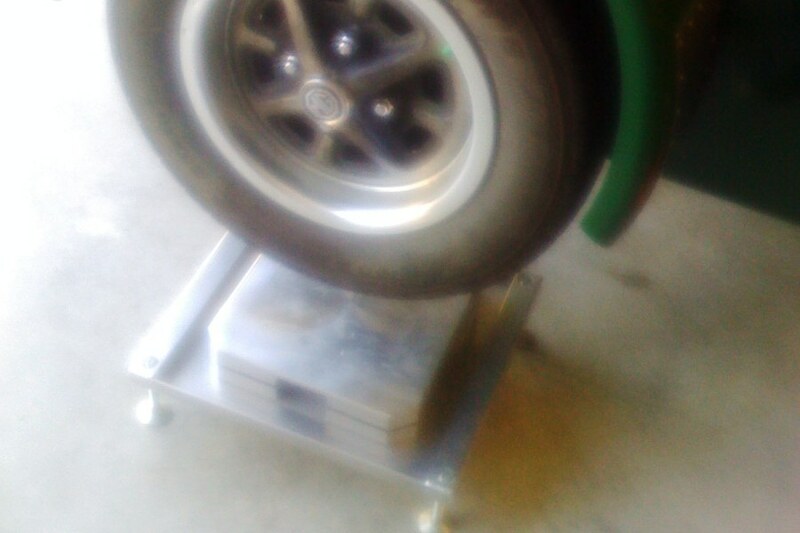 This resulted in a ground clearance of 5-1/4" up front and 5-1/2" in back, which was eerily close to the ride height we specified in our two-year-old PowerPoint sketches. Despite that, we still thought we were pretty close. 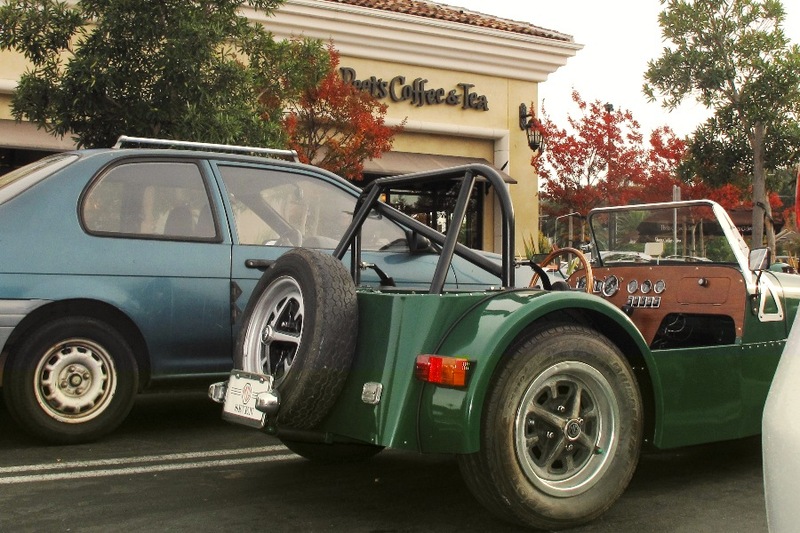 By far the best thing about getting the car corner-weighted was the 6-mile drive across town. As you know, all of our test drives so far have been limited to a four mile radius around the homestead, which I hate to say is starting to get a little boring. Not the car, of course. The car is just as fun as always. But the streets are getting kind of old, and the novelty is probably starting to wear off for the neighbors, too. Plus, you can't really open up the throttle, at least not for very long, so we still don't know what this thing is capable of. Driving along open roads near the old Hamilton Air Force Base gave us a hint. We always enjoy how quick the car is, but speed isn't even the best thing about this car. The best things are its stability, ride, and handling. We don't know how that could've happened. The car could've been wildly unpredictable, with harsh springs and rattling panels and the suspension bottoming out all over the place. 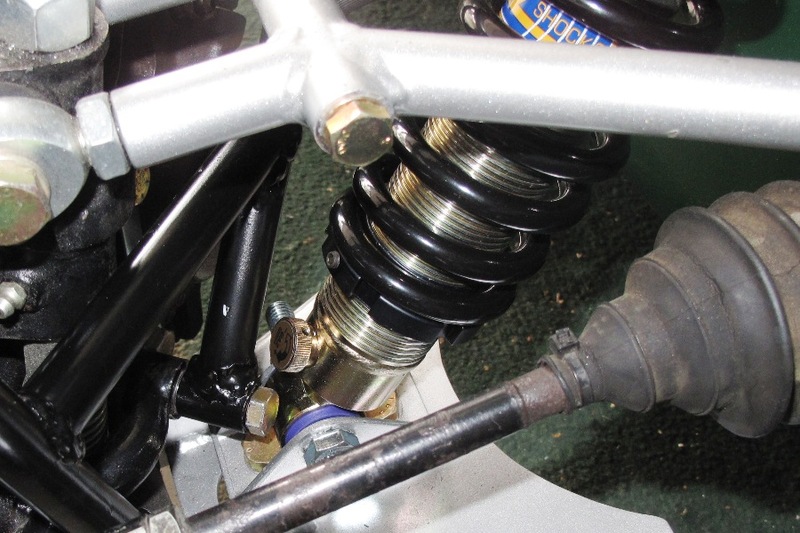 We took a lot of people's word for how to design suspension arms and how to select springs and how to avoid bump steer. It almost looks like they were right. Part of the car's stability comes from a very solid chassis. There's just no flex at all. Jack up the Locost from either side and you could open and close the doors easily. If the car had doors. The ride is definitely on the firm side, but bumps are absorbed entirely by the springs, not the chassis, and there's no jarring on the roughest roads. Obviously the design of the Locost space frame chassis is responsible for most of that stiffness, but so was our use of heavy-gauge steel sheeting on the floor, firewalls, and transmission tunnel. What's really amazing to us is how neutral the steering is. Tire slip angles are a function of a lot of different variables, like the weight on the tire and the tire's angle to the ground. Okay, so just two variables. But a lot of things affect those two variables, like spring rates and weight transfer and camber changes as the car rolls. Somehow, and we're not saying how because we don't know, our front and rear slip angles worked out to be exactly the same. The car drifts through turns without a hint of plowing or the back end getting loose. We take no credit for this. The car's handling has nothing to do with our engineering expertise, and everything to do with sheer dumb luck. 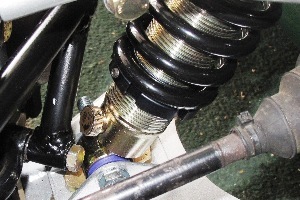 It might've helped that we didn't try to get fancy with things like inboard shocks or independent rear suspension. We varied as little as possible from the stock M.G. suspension and the plans in the book. We took the conservative approach and it just worked out. And we're pretty happy about it every time we toss the car into a turn, and in case we haven't mentioned it lately, this thing is a blast to drive. We made it all the way to our friend's house without interference from the local city revenue generators. 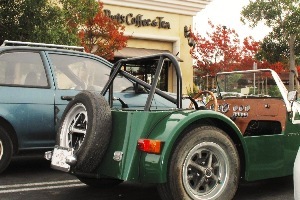 We had one nervous moment when we passed a cop going the other way on Bel Marin Keys Boulevard, but unusual-looking vehicles aren't all that unusual in this part of town, particularly on a bright Sunday morning, so he didn't flip a U-turn to investigate. We drove on into town past shopping centers and gas stations and other heavily-populated areas without attracting any further untoward attention, all the while greatly enjoying the change in scenery. The actual corner-weighting process was an interesting experience. We weren't far off with the initial settings in back, having to raise the right spring only 1/16". In front it was a different story, as both springs had to be raised almost an inch. Oddly, when all was said and done, the ride height barely changed at all. Front and rear are both at exactly 5-1/2". So we're pretty happy now knowing the suspension is nicely balanced, although we're slightly less happy knowing the actual weight on each corner of the car. Or actually the sum of those weights. It all added up to 1584 lbs. Kind of a porker. There was a little gas in the tank, but maybe only 20 lbs. A book Locost is supposed to weigh 1200 lbs. We're not sure where the extra weight came from. Okay, we are. All of that silicone caulk for the body panels. Plus, the 1.8 liter version of the venerable M.G. B-series engine is kind of hefty. Add to that the giant Salisbury rear axle, giant cast iron brakes and front hubs, and many other giant M.G. parts, and a good case could be made that all of that extra weight wasn't entirely our fault. Only partly. So apparently the reason the car feels so solid, like it's just one big hunk of steel, is because it's just one big hunk of steel. Heavy-gauge steel. On the plus side, an MGB weighs roughly 2400 lbs., so in that context 1584 lbs. doesn't look all that bad. With about 80 hp at the rear wheels in a stock MGB, dropping 800 lbs. is equivalent to adding 40 hp, and an MGB with 120 rwhp is a pretty exciting car. 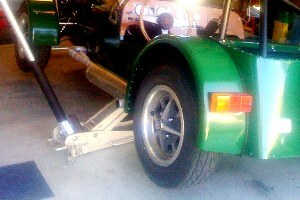 Especially if you consider the MGB's strong suit isn't power, but torque, as in 110 ft.-lbs., same as a 1.8 liter Miata. So the car is fast, although obviously not as fast as for example a 1200-lb. Locost would be. Somewhat discouraged, we stopped for gas on the way home. The station was pretty busy, but we managed to fill the tank and get out of there without anyone approaching us to ask questions or offer comments. We did this by our usual method of ignoring our surroundings, avoiding eye contact, and looking mad. In any case, as we mentioned before, unusual-looking cars are pretty common in these parts, so we're encouraged that from here on out we should be able to enjoy driving the car without anyone noticing.